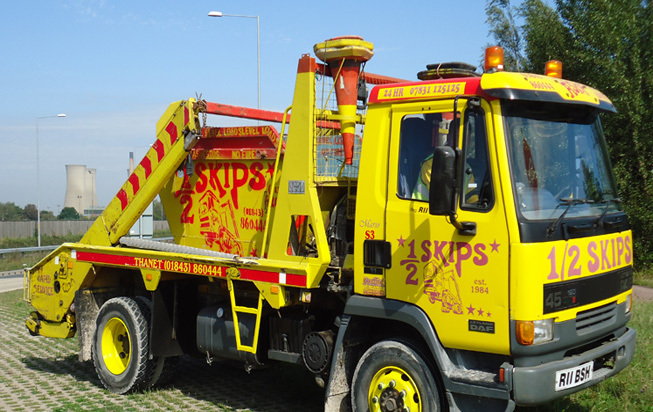 SKIP 4 U offers trade skip hire across East Kent. Whether you are looking for a short term fix or a long term multi load solution, we can find the right skip for you. With approximately 400 skips ranging from 2cu/yds to 12cu/yds, 6 lorries and supported by a team of around 20 drivers/recyclers, you know that we're the right choice for you. In addition to this service, we are also fully registered with the Environment Agency, we have a drop doors on all of our skips and we offer a same day delivery service. What more could you wish for? The cost of the skip depends on how big it is and a few other things. We provide skips that are incredibly competitively priced and the best thing to do is call us on 0800 980 6663 so we can help you to work out what you will need. WHAT SIZE SKIPS DO YOU HAVE? We also offer Roll On Roll Off (link to page) and grab lorry. We are happy to accept most forms of debit or credit card over the phone or you can pay our driver by cash or cheque on delivery. DO YOU OFFER PAYMENT ON ACCOUNT? In some circumstances – yes we do. Please call 0800 980 6663 for details. WHAT ITEMS AM I ALLOWED TO PUT INSIDE MY SKIP? If you are worried about something that you want to dispose of, please call us first – we are happy to take most things but cannot take asbestos, florescent light tubes, loose paints, hot ashes, fluids, toxics or acids. We will however be happy to advise on where this waste can be disposed of in a safe and legal way. You will require a permit if you would like to put a skip in a public area on a road and our ugly drivers will be more than happy to help to sort this out. Your waste will be taken to our recycling facility in Sandwich and then hand sorted. Everything that can be, will be recycled. You can fill a skip to the brim but no more – some people like to use boards to make the skip bigger, but with us you don't need to you can just order a bigger skip! Overloaded or dangerously loaded skips will not be taken, so if it looks like you will need another skip just give us a call and we'll arrange the best option for any left over waste. Skips should always be a level load for the safety of the highway (we don't want anything falling out on the way back! WHAT HAPPENS IF I DAMAGE THE SKIP? Our Ugly Drivers love their skips, so please do all you can to keep them in good condition. We ask that you don't try to move the skip with diggers or other machines or do anything to damage the skip – if you do you will be charged for the repair.